I remembered going with my mother to Patria de Cebu many years ago to have our foot reflexology by their resident practitioners. This week I decided to return to this place and see if it still has that homely appeal that its loyal patrons have come to know of. 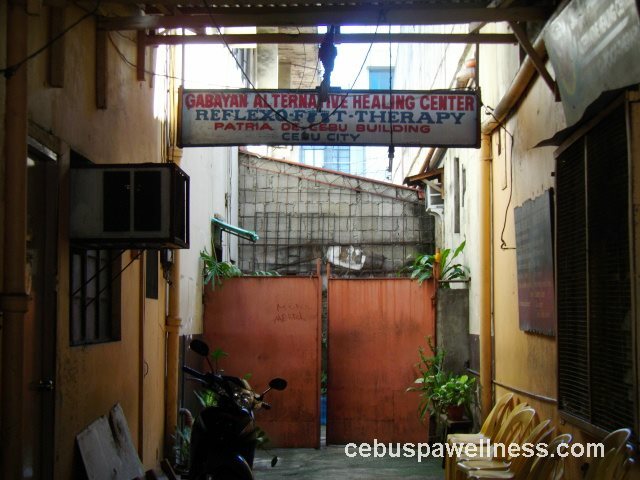 Today’s blog will give you a glimpse of what it’s like to have foot reflexology here in Cebu’s well-known alternative healing center. Patria de Cebu, Inc. is located in front of Cebu Metropolitan Cathedral. 1. 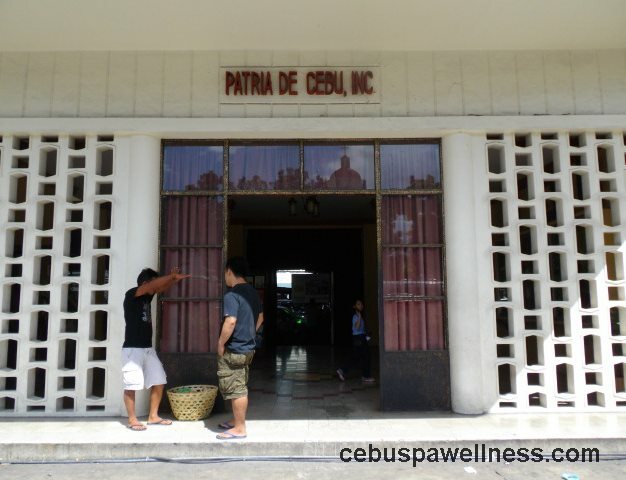 At the back of Patria de Cebu is where you can find their popular reflexology healing center. 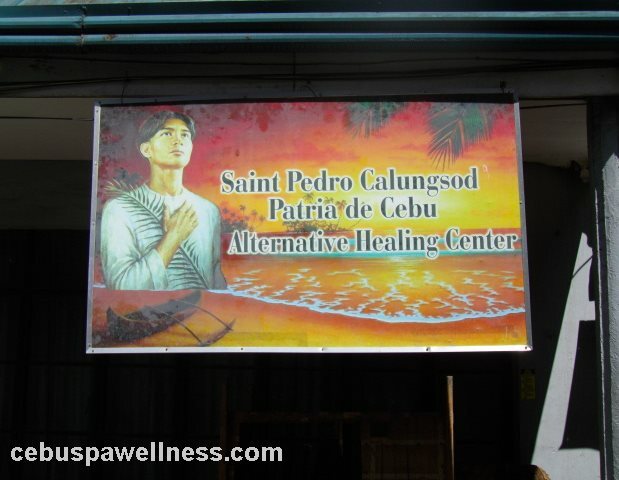 It was previously named Gabayan Alternative Healing Center but has been changed to Saint Pedro Calungsod Patria de Cebu Alternative Healing Center. This is what they used to call this place. 2. They no longer serve their customers in an al fresco setting like they used to. My masseur told me later that they have moved inside a room (just right across) because the stinking drainage has become a problem for them. They have upgraded a little bit and customers can now enjoy a pleasant air conditioning while having their massage. 3. All of their practitioners now wear bright yellow T-shirt as their uniform but in the past they basically just wear any casual outfit. I think this is a step forward to projecting a professional image to the public. 4. I’m not sure if my mom ever paid anything besides the donation and things needed for the massage before. But today an attendant will require you to pay P5.00 as their maintenance fee as soon as you sit down and start the session. It’s a pretty small amount though and I’m sure anyone can afford it. It’s a little painful but you will like the results later. 1. They operate on a donation basis because they’re not really a business organization per se. Their practitioners are volunteers so they don’t receive a fixed salary like typical employees do. They share whatever amount they have collected from the donation box. There’s no minimum amount of the donation but please, if you know that these people have no fixed income, then donate more. These people have families to feed and bills to pay. 2. If you can’t bring your own alcohol, face towel and massage oil then you can buy them from their counter. Although they are not classified as a business company, selling these items might be their entrepreneurial workaround to recoup their investments. Because really, who would actually go to a massage place and bring their own alcohol and massage oil? No one. So they’ve probably thought of that and make a business out of it. I paid P63.00 for all three items which is not bad and I get to keep them after. 3. You need to sign your full name on a name list outside the room before you can start. 4. You need to read the precautions posted on their walls. But if you failed to do so, your masseur will remind you and ask some basic questions like: Are you pregnant?, Is this your first time to have foot reflexology massage?, Did you recently have a surgery? So make sure to be honest with your answers so the session won’t lead to any major health complications and legal repercussions for the healing center. 5. Each session lasts between 30 minutes to an hour. They have several practitioners but sometimes the whole place is packed especially on weekends so there will be times when you’ll have to wait for a couple of minutes before your turn. Not to scare you or anything but their foot reflexology can be painful for the first timers. This might not sound enticing, but this is just to set your expectations right if you want seek an alternative treatment. Firm pressure is applied to different parts of your foot using their bare hands–fingers, knuckles and palms and sometimes with the aid of a hard plastic stump. It is believed that the body’s vital organs are connected to the feet. If you feel a sharp pain on some points on the sole, there’s a health problem with the connected organ. Even Jesus Christ is into foot massage in His time. Results from a foot reflexology will vary for every person. As for me, I experienced that great sensation of lightness and I felt some tingling around my legs. It could be from the energy flowing through my body brought by the stimulation on my feet. In fact, I felt so relaxed and sleepy, I went to sleep a few minutes after I arrived home. Don’t expect anything magical on your first session. Generally, the results are subtle and will depend on health issues and purpose of the client for seeking this treatment. You are likely to feel the benefits if you are doing it on a regular session (perhaps once a week for two months). Where can I find Patria de Cebu? Patria de Cebu is located right in front of Cebu Metropolitan Cathedral in P. Burgos Street. 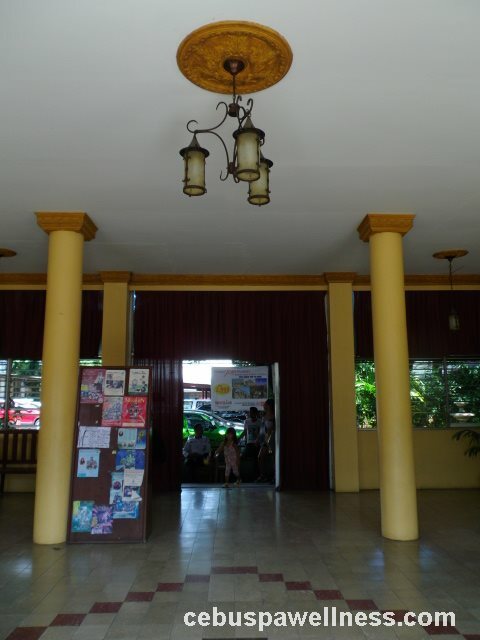 Here’s the exact location based on Google Map: http://bit.ly/1nengni. Hi Vanessa, thanks for visiting this blog post. I’m not exactly sure as to what their schedule is but you may call this number just to be sure: (32) 254 2411.